Heidi Milliner was getting frustrated by not being able to tell all of her #10 brushes apart. 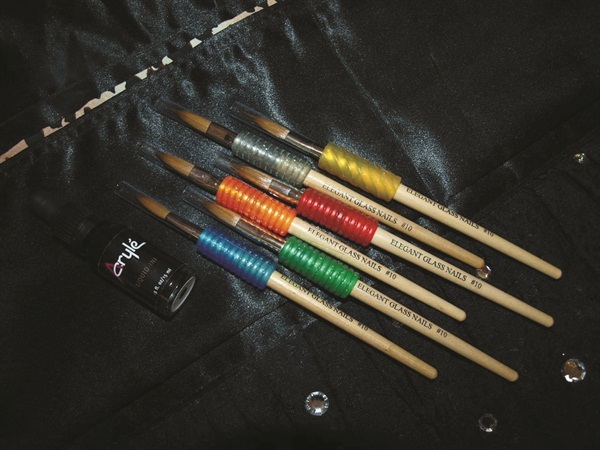 Milliner, the owner of Tickle Sticks Nail Salon in Phoenix and director of education for Elegant Glass Nails, would notice her acrylic monomer dye would get absorbed into the bristles, interfering with the next application. The solution came from a surprising place: the office supply store. Now, she uses colored pencil holders to tell the brushes apart. “Colored rubber bands work well too,” Milliner says. We love the creative new use of a standard household item!